As we often see when the comic industry enters a period of slowing sales – relative to the recent boom period, that is – there’s been a fair amount of hemming and hawing about where comics are right now. Are they in a healthy place? Is a downturn on the horizon? Could a market tumble be around the corner? All fair questions, and if there was a magic eight ball for the comic industry I’m guessing the answers would be “mostly,” “probably not” and “too soon to tell.” Comics, for the most part, are doing well. The comics are of a high quality, retailers are happy, and despite a down month in September, 2015 has still out-earned 2014 by 6.58% so far. 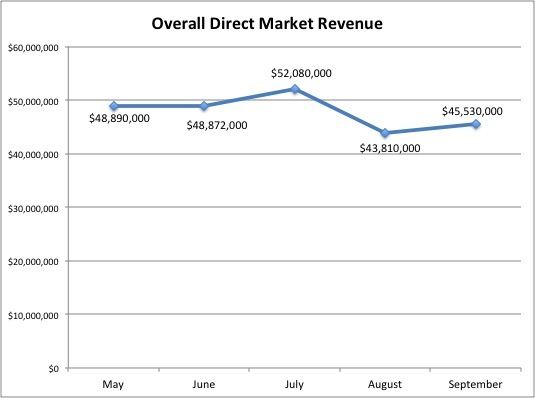 DC didn’t even have a bad month in September 2015. They just had one of a much lower volume than the year before. That chart showcases that things aren’t bad across the board in the direct market, as well. 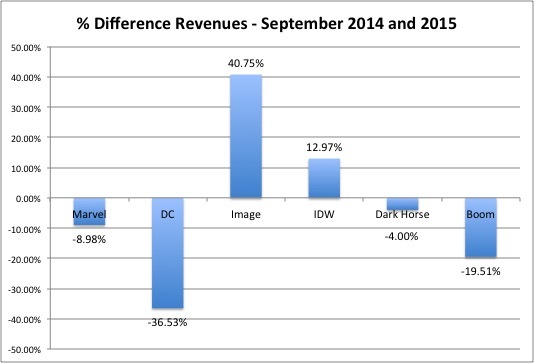 While four of the top six publishers dipped, two had strong year-to-year leaps, led by Image’s almost 41% rise in a “down” month. This chart emphasizes that – again – the decrease had more to do with the incongruous nature of the comparison than anything else. I’d have been more surprised if it had matched last year, given the obvious disparity of premium releases. If I was a highfalutin industry analyst, I’d say this is much ado about nothing. While they didn’t have a significant decrease year-to-year – a smidge under 9% – Marvel’s present is about as beleaguered as New York City is in one of their typical events. As others have already noted, Marvel’s delays in relation to Secret Wars seem to be impacting the market negatively. But it’s a lot more than that. The way Secret Wars has been botched – despite a quality product at its core – isn’t just potentially impacting the bottom line of its publishing side, it’s hindering the potential of its All-New, All-Different initiative and the general readability of its product. 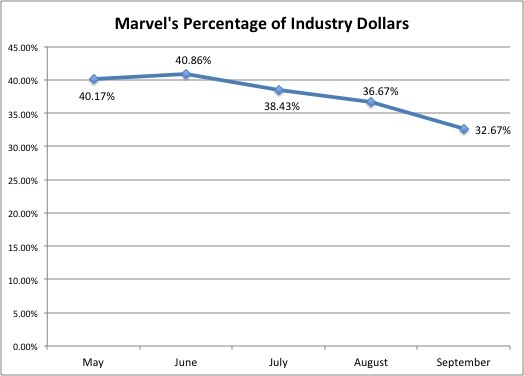 While the industry has seen slight expansion and reduction from a base level over the past few months, Marvel’s been going downwards steadily. After a high in June thanks to the launch of many of the Secret Wars tie-ins, Marvel has dipped more than eight percent overall. Predictably so, I may add. Most comics – meaning anything besides Saga and The Walking Dead – see their sales peak with their debut. Attrition settles in with each passing issue, and that’s what Marvel’s seen after replacing almost every single ongoing title with tie-ins. Realistically, the only reason they haven’t had even greater decreases is because Secret Wars itself has barely dipped at all since its second issue and because the Star Wars titles are so popular. As they say, a rising Star Destroyer lifts all speeders. 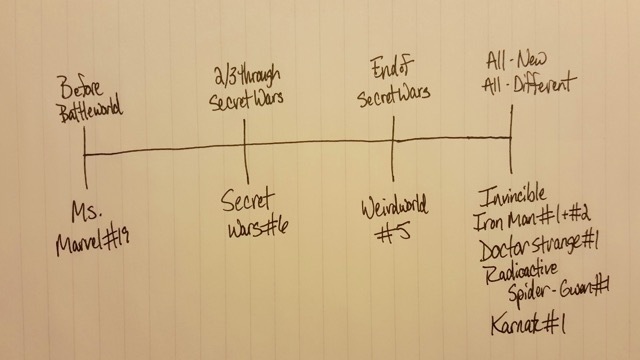 But the delays for Secret Wars may mask a pending drop-off for the title. For the event itself, the worst may be yet to come if the overall performance in-store matches what one retailer I spoke to has seen. 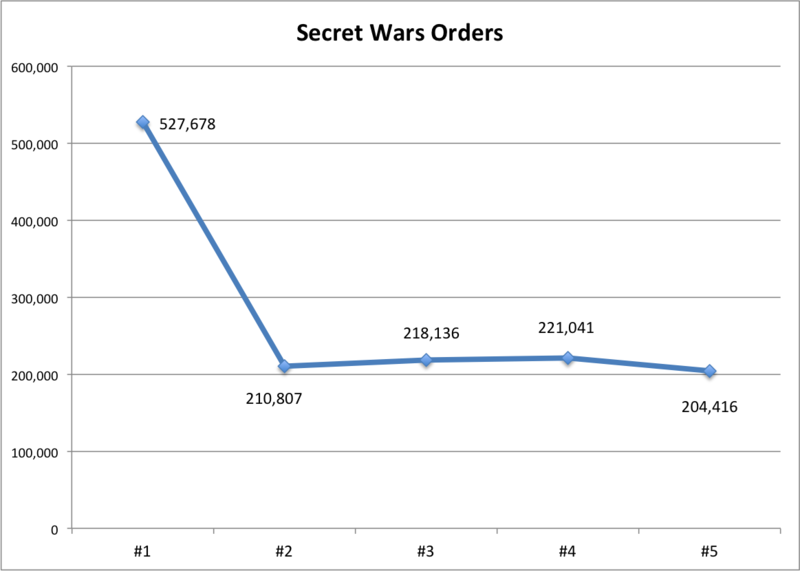 Brian Hibbs, the owner of Comix Experience in San Francisco, shared that in-store sales for Secret Wars #6 are a third lower than where they were over the same period with issue #5. That’s atypical for a mini-series, he said, with the vast majority dropping one to two percent between issues that late in their run, but most minis don’t have a nearly two month gap between issues. While that differs with some of the other retailers I spoke to, it will be interesting to see how much the orders for the concluding chapters drop if Hibbs isn’t alone in seeing a decrease of in-store purchases. Beyond that, what’s concerning is how the wheel of delays to the main Secret Wars title and its bevy of tie-ins could be affecting Marvel’s All-New All-Different initiative, both for Marvel and the retailers buying their products. Take the shop I frequent, for example. They’re big believers in Marvel, and when Secret Wars dropped, they bought in big. Today? They have considerable stacks of Secret Wars tie-ins on the shelves unsold. When All-New All-Different launched on October 7th with Invincible Iron Man, Doctor Strange and Amazing Spider-Man, the stacks for each of those were roughly half the size of the average Secret Wars title. That made me curious, so I asked the person who orders for them if they had decreased their numbers in the face of Marvel’s recent slump. The response was a quick answer in the affirmative. That is not representative of the industry as a whole, but it is interesting to see. Retailers are trained to hedge their bets because of how the average comic consumer behaves, with orders decreasing to match projected attrition. But you don’t normally see that on a high-profile relaunch. While the promoted order numbers for certain titles may be staggering, one has to wonder how top heavy that number was thanks to high-level incentive variants and the usual push for Marvel debuts. We likely won’t see the impact Marvel’s present has had on these books until retailers get to adjust orders for future issues based off in-store performance. And according to Hibbs, that’s already happening. And it’s significant. “We’re definitely changing those final order cutoff numbers to be in line with reality. My number twos, or in the case of Iron Man, #3, were cut pretty drastically,” shared Hibbs. Hibbs puts part of the onus on himself, as he ordered bigger on the first issues than he may have otherwise because of how the most comparable initiative from the recent past – DC’s New 52 – performed in his store. With an entire line of new number ones at his disposal, he estimates that his sales for DC increased by 300% initially. He thought Marvel’s similar relaunch could potentially do the same. Hibbs shared that while the results aren’t terrible, they’re also not great – “it’s below where I want it to be” – but it’s still profitable and he has hope for the long term. “I’m disappointed about the results, but I’m still making plenty of money off the books,” he said. “I’ve got plenty of copies left, but you know what? It’s not going to be problem three months from now when I still have copies of Iron Man #1 to sell. And that’s okay. 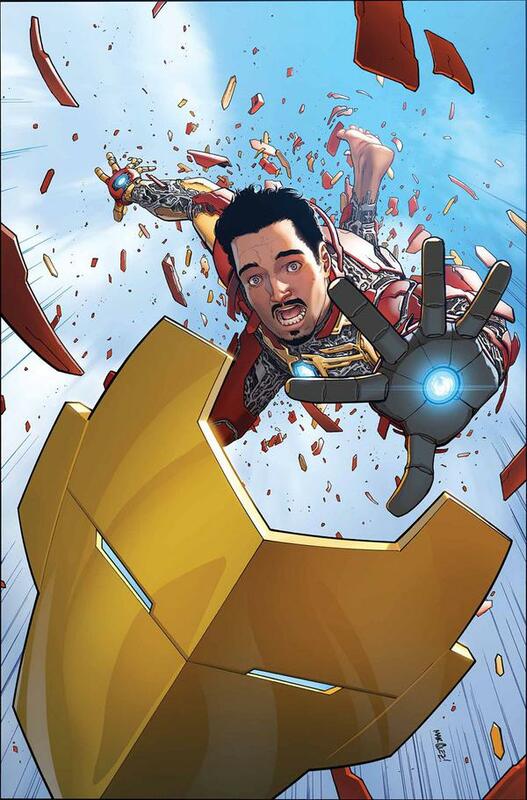 There’s nothing wrong with having copies of Iron Man #1 to sell. Patrick Brower’s seen similar softness in the performance of All-New All-Different at his shop in Chicago – Challengers Comics + Conversation. “As this is being written, we’ve had three full weeks of All-New All-Different Marvel sales and honestly, they are lower than expected,” shared Brower. He has theories why. “When DC Comics launched the New 52 in September of 2011, comic fandom was crazy high for that. Sure, those sales numbers didn’t last, but the excitement out of the gate was (much) higher than expected. We didn’t expect that for ANAD (All-New All-Different) Marvel (it would be a different story if all of the ANAD books came out in the same month, but that would have probably bankrupted us), but we did think more people would be interested,” he said. Ralph DiBernardo of Jetpack Comics in Rochester, NH has seen limited drop off in Secret Wars itself, but he’s seeing something unexpected impact All-New All-Different’s sales. Brower’s seen similar trepidation from some of his customers, and that puts retailers – who rely on in-store sales data to help decide orders – in a very sticky situation. Do you cut orders despite the long-term potential of readers jumping on whenever Secret Wars ends? Or do you keep them high and hope readers remember to come back? It’s a difficult question. Either way, for an initiative that many hoped would trigger a large bump in Marvel’s in-store sales, DiBernardo’s seen only a little one so far. “We haven’t seen any verifiable loss in sales for the ANAD titles due to Secret Wars dragging. Much of that sales strength may come from a majority of our customer base’s loyalty to specific titles or simply good stories rather than a respect for a universe’s continuity,” he added. For Hibbs, his concern isn’t for the flagship titles we’ve seen so far. 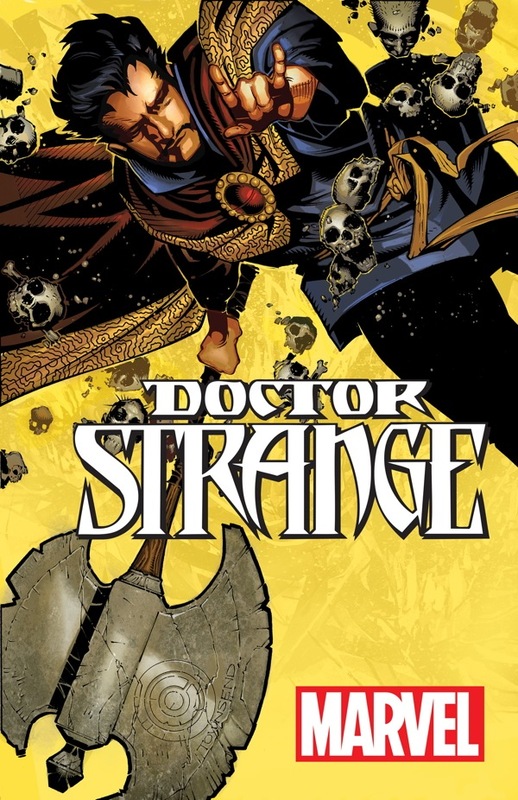 According to him, books like Invincible Iron Man #1 and Doctor Strange #1 will continue to sell consistently, especially the “exceptional” Strange. Where the line may suffer is with the lower tier titles, in his mind. With all that said, one thing Hibbs emphasized multiple times was that All-New All-Different’s relatively subdued sales is due to a lot more than just Secret Wars being late. “It’s hard to say where the fault lies. Is the fault because Marvel’s marketing didn’t do what it needed to do? Is it because people are bored with the idea of a line-wide reboot? I don’t think so. Is it because they can watch Agents of SHIELD on television and they don’t need to pay for Marvel comics? Is it because Secret Wars baited and switched them and they’re pissed off?” asked Hibbs. To call Marvel’s All-New, All-Different line launch a big deal is an understatement given how the House of Ideas has promoted it. While there is always a lot of hype behind any big change at Marvel, to see Marvel’s Senior VP of Publishing Tom Brevoort call it “the beginning of the next 50 to 75 years of stuff that we do” is significant. This is Marvel’s biggest attempt to develop larger readership numbers – including current, lapsed and new readers – in some time. And that’s saying something given the frequency they relaunch titles at these days. In the last three weeks, I’ve bought comics that work well as individual stories. But when read as a collective whole, they struggle – especially chronologically. Even for comics, having eight titles released over a three week span that exist in four wildly different timeframes is problematic. It removes any sense of cohesiveness to the works and dissolves the basis of Marvel’s comics: the shared universe. As Brower shared with me, “while it certainly isn’t uncommon for Marvel to publish books out of order, every time they do it they confuse and alienate people.” That’s certainly the case for me, as I’ve tried less books than I originally expected because of how broken Marvel’s line is right now. Given the uncertainty that surrounds Secret Wars itself and its ultimate end date, why wouldn’t I just wait for Marvel Unlimited on the vast majority of the All-New All-Different line? Even worse is how Weirdworld concludes, seemingly spoiling what happens at the end of Secret Wars. I’m not one to worry about spoilers, but it’s maddening to read these comics because of how incongruous they are. Publishers like Marvel get a lot of guff for editorial oversight creating a negative creative environment, but maybe a little more could have helped these books read as part of a whole rather than as a disjointed mess. While Hibbs has found that his own enthusiasm for the relaunch has waned in part because of Secret Wars not being completed yet, he has another issue with it. It’s hard to disagree with that sentiment. Sadly, Marvel got one part right. Most of the books I’ve read so far in October have been solid. Ms. Marvel #19 is on the shortlist for my favorite comics of the year, Doctor Strange might have been the best comic I’ve read featuring the character, and Karnak was spectacular in its oddness. Those are good things. But Marvel has always expressed interest in creating something that was greater than the sum of its parts. They want the Marvel Universe to be something people can get lost in, enjoying the line more as each additional title fills in another piece of the puzzle. Now? Readers are just lost, and that doesn’t bode well for their future. There are a lot of problems for Marvel right now, at least on the outside looking in. It’s not just Secret Wars delays and the soft sales of All-New All-Different, but more holistic changes in how readers behave are impacting them as well. For example, Hibbs shared an interesting tidbit he’s seen in this boom time of comics. “Something to consider – and I don’t know if this is true for in all stores everywhere but it is for my store – but the percentage of the people who are buying Marvel and DC superhero comics is at the lowest point it’s ever been in the history of my store,” he said. Like Hibbs shared earlier, Marvel’s period of struggle in what should be their finest hour is about more than just one event being late. It’s because of a whole mess of things, and that list would be different for every retailer. But, again, it hasn’t helped either. Both Hibbs and Brower believe that Marvel have compounded their problem by double-shipping books. 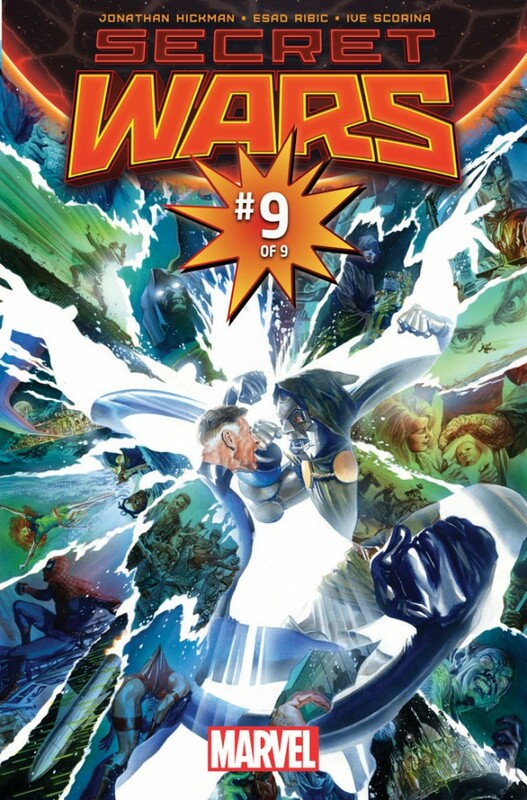 Hibbs was perplexed by Marvel’s decision to double ship Secret Wars itself at the start as it put them in the position to feel an even greater burn when the title didn’t hit its deadlines. He views it as a decision made for the good of the business, not the comics. 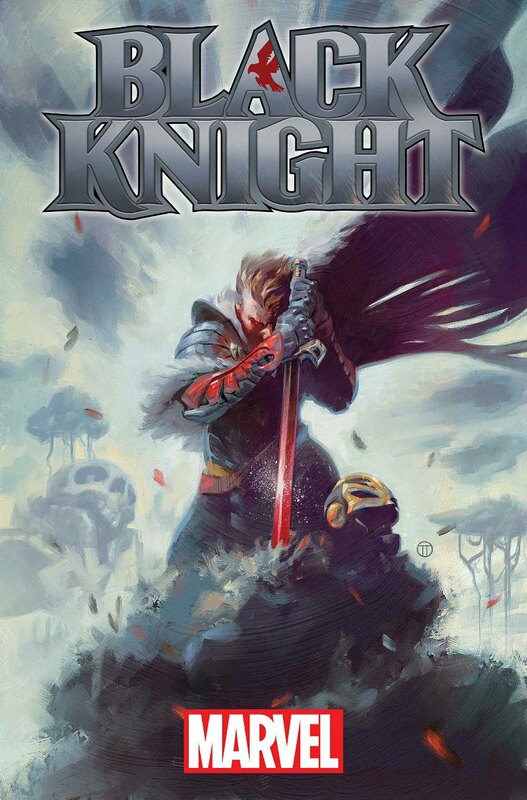 Brower’s issue is also related to Marvel’s myopic approach, as he feels their objective for doubling up on some of their recent titles was to game the ordering system. This is a problem for everyone involved. That’s including not just the readers and retailers but even the creators who are crafting some of the All-New All-Different titles. This was meant to be one of the banner moments in Marvel’s history. The time where everything was new and different. A time where readers of all varieties could be introduced to not just one or two series, but the whole Marvel universe. While it hasn’t been a complete failure by any means – even the retailers who were the most down on the initiative have found All-New All-Different to be profitable – it has been less than it could have been. It’s possible that it could prove to be more of a jumping off point than a jumping on one. Take this customer from Hibbs’ shop, for example. Is that something Marvel considers in their decision making process? It’s hard to tell. They should, and likely do. But as Hibbs intimated, what they’re doing feels like short-term thinking, with an eye fixed on their upcoming bottom line and not on the long-term health of the industry. It’s difficult to fault them for that focus, as they’re a business, and businesses are designed to make money. But when today comes at the expense of tomorrow, that’s when trouble arises. Only time will tell if the future is the cost of Marvel’s recent moves. Thanks to Patrick Brower, Ralph DiBernardo, Brian Hibbs and Matthew Klokel for their insight on this piece. All sales numbers were gathered from Comichron and developed by myself.